Home ELECTIONS Will Elders’ rebuke return to haunt the opposition? THE first time former United Nations secretary general Koffi Annan and his fellow international diplomats tried to visit Zimbabwe in November 2008, the government slammed the door on the ‘Elders’, triggering international condemnation. Harare, arguing that “no humanitarian assessment could be carried out in the few hours” the Elders planned to be in the country, told Annan, Graca Machel and Jimmy Carter, already in Johannesburg en-route to Zimbabwe, to postpone their visit. “We call for an end to the Mugabe regime’s brutal repression of basic freedoms and for the formation of a legitimate government that represents the will of the people as expressed in the March 2008 elections,” Bush said in a statement. Founded by Nelson Mandela in 2007 and with no less than two former UN secretaries general (Annan and Ban Ki-moon), six former heads of state and one prime minister, in addition to four Nobel Peace laureates, the Elders group possesses considerable clout. Which is why their visit to Zimbabwe last week – more than a decade after their first unsuccessful attempt – was significant. Which is also why their scarcely veiled criticism of the opposition is not to be taken lightly. 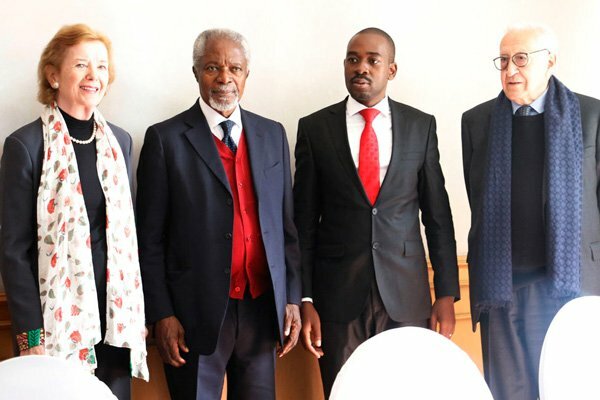 Annan was accompanied to Zimbabwe by the former President of Ireland and UN High Commissioner for Human Rights, Mary Robinson, and veteran Algerian diplomat Lakhdar Brahimi, to assess the political environment in the country ahead of Monday’s general election. The Elders’ visit coincided with another wave of rising political tensions stoked by the main opposition grouping, the MDC Alliance, which has threatened to make the country ungovernable if its demands, mainly over the printing and design of the ballot papers, are not met. Addressing a press conference at the end of their tour, during which they met the main contenders in the July 30 poll, including President Emmerson Mnangagwa and his chief rival Nelson Chamisa of the MDC Alliance, the Elders warned against escalation of tensions. The eminent diplomats flew into Zimbabwe amid frenzied debate on Zimbabwe Electoral Commission (ZEC) chairperson Priscilla Chigumba’s private life, mainly on social-media. These attacks, Robinson said, are unacceptable. Responding to a question on opposition demands made to ZEC, Annan said: “There are demands and there will be demands. What is important is that we all play by the rules and make reasonable demands,” he said. While the Elders’ official statement did not carry the admonition they delivered at the press conference, it should concern the opposition that their demands are being considered unreasonable and its methods deemed to be inciting. This, coupled with murmurings within some observer groups and diplomatic circles that the opposition is overplaying its hand, does not bode well for them. That the Elders also commended Mnangagwa for his calls for a free and fair poll, suggesting yet another respected international organ is buying the president’s rhetoric, which the opposition isn’t, would also have been particularly galling. And ominous. “They hailed the improvement in fundamental freedoms that has obtained in Zimbabwe since the end of 2017, and President Mnangagwa’s repeated emphasis on free and fair elections,” reads the statement. This early assessment chimes well with the Mnangagwa administration’s objective. In May his spokesperson George Charamba told reporters that the general election was about international re-engagement and restoring legitimacy. A foreign policy tool. While the pre-election period has been largely violence-free with the opposition enjoying unprecedented, unfettered access to the ruling party’s rural strongholds, concerns remain about other aspects of the vote, chiefly the quality of the voter register and the design of the ballot. The opposition plans to picket ZEC this week to highlight these concerns. While all this presages another disputed election, it remains to be seen if, this time around, international observers consider these to be reasonable demands. Did the MDC blink, again?